Each of the beautiful Sunscape Resorts & Spas offers Unlimited-Fun® with everything you need for an entertaining, worry free vacation right at your fingertips. With just the right mix of excitement, relaxation and creature comforts, you're sure to love your time in the sun. Nestled along a gorgeous stretch of golden beach in Banderas Bay is Sunscape Puerto Vallarta Resort & Spa, located only 10 minutes from the Puerto Vallarta International Airport and downtown Puerto Vallarta. Perfect for shopping, dining, and other activities, the resort has a prime location in the hotel zone for guests to branch out and explore. Perfect for families, couples, and singles, each guest can take advantage of an Unlimited-Fun® getaway, which includes luxurious guest rooms complete with balconies or patios, limitless buffet and à la carte dining with no reservations required, top-quality beverages, and more. And, no wristbands are required throughout the entire resort! Guests of all ages can take part in a variety of daily and nightly entertainment, including movies on the beach or terrace, tailgate parties for Monday night football, and x-game competitions. There are also two swimming pools and an assortment of watersports. Children ages 3-12 will enjoy the Explorer's Club for Kids, while teenagers ages 13-17 will have a great time at Core Teens Club. Pampering yourself has never been easier thanks to the Sunscape Spa (coming in 2017; guests can currently utilize the Secrets Spa by Pevonia® at the adults-only Secrets Vallarta Bay; transfers are not included). Choose from services like massages, facials, manicures, pedicures, and more. Enjoy your massage out at the beach gazebo, where you can hear the waves crashing in the distance, lulling you into complete bliss. For an even higher level of spa enjoyment, the concierge will be happy to book treatments at Secrets Vallarta Bay at the Secrets Spa by Pevonia®. Also arriving in 2017 is the fully-equipped fitness center, which offers a variety of equipment to keep you in shape during your vacation. For those who prefer group classes, there is also a separate room for yoga and aerobics. With so many things to do and see, your getaway to Sunscape Puerto Vallarta Resort & Spa is sure to be a memorable experience that lasts a lifetime! 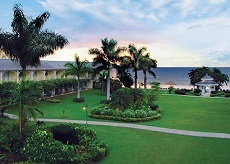 Break away to beautiful Montego Bay and experience Unlimited-Fun® at the astonishing Sunscape Cove! 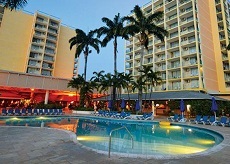 This all-inclusive beachfront resort is located just minutes away from the Donald Sangster International Airport and the famous "Hip Strip", which offers luxurious shopping and an exciting nightlife. Additionally, guests of Sunscape Cove also receive full access to the facilities and restaurants available at Sunscape Montego Bay. Situated on a private peninsula, Sunscape Cove is surrounded by the Montego Bay Marine Park which offers protected swimming areas and remarkable snorkeling. The 1800 feet of pristine Caribbean beach boasts powdery white sand and turquoise waters. On the beach, guests can enjoy watersports such as snorkeling, volleyball, or kayaking. When you're looking to cool off, head on over to any of the four pools, including the main pool with a swim-up bar. Kids love the Pirates Paradise Waterpark which includes a pirate ship and lazy river. Rejuvenate your body on vacation with the Sunscape Spa, offering massages, body scrubs, facials and more (additional charge). The state-of-the-art fitness center features a variety of exercise equipment and separate yoga and aerobics rooms. The Explorer's Club for Kids and the Core Zone offer entertaining supervised fun for both children and teens of all ages and is available next door at Sunscape Splash. Guests of Sunscape Cove have eight gourmet dining options to choose from, including a café, a buffet, and six a la carte restaurants including those from the neighboring Sunscape Splash resort. Portofino features Italian cuisine served in a Trattoria-like setting, and Terrace Restaurant serves up local inspired cuisine in an authentic outdoor setting. When the sun goes down, the entertainment heats up with live music, local talent, movies on the beach, and more. Each of the 122 guestrooms include chic décor with a Caribbean flare, a furnished balcony with stunning views, 24-hour complimentary room service, and a minibar refreshed daily. Sun Club amenities feature a private access to a lounge with Wifi internet access, daily continental breakfast service, and more. 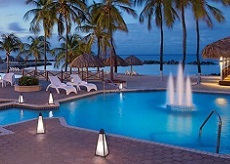 Enjoy a fun-filled getaway at Sunscape Curaçao Resort, Spa & Casino. At Sunscape Curaçao, all guests will enjoy an Unlimited-Fun® vacation where everything is included from top-shelf spirits and daily refreshed mini-bar, to limitless food and beverages, and endless daily activities. Sunscape Curaçao is the perfect getaway for families, friends, couples, and singles looking for the ultimate fun-filled vacation. Located just two miles from the diverse capital of Willemstad, guests can enjoy all the excitement the city has to offer. Sunscape Curaçao has it all - six savory dining options, daily activities, four swimming pools, an outdoor Jacuzzi, and much more! From the on-site dive center, catch a boat to the National Underwater Park and enjoy diving and snorkeling at one of the most popular diving sites in the world. Be welcomed by a family-friendly check-in experience, complete with red carpet stairs, welcome treats, and resort passports for kids upon arrival. Enjoy 341 spacious guest rooms and admire the beautiful views from your private balcony or terrace. Relax with finely appointed amenities for the utmost comfort and convenience. For an even higher level of services and amenities, upgrade to The Sun Club and receive an upgraded suite in a premium location, daily hors d'oeuvres and exquisite desserts with fine liquors in the private lounge, kids' amenities, and more. Experience local and international flavors at any of the six savory dining options. Guests can choose to enjoy delicious cuisine from one buffet, three à la carte restaurants, a grill, and a cafe. In addition to experiencing amazing cuisine, indulge in enticing cocktails at any of the six bars. Your Unlimited-Fun® choices are endless with great food, great bars, and even greater evenings. The Explorer's Club for kids, a fully supervised program for children ages 3-12, is designed to entertain the little ones with different programs based on science, nature and exploration. The Core Zone features daily activities and entertainment and a vast array of sports and activities for teenagers, including photography lessons, DJ classes, weekly mixers, and more. The Spa offers many different treatments and therapies. Pamper yourself with one of the many different massages, facials, body scrubs, reflexology treatments, pedicures, and more! 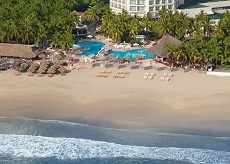 Vacations at Sunscape Dorado Pacifico Ixtapa are anything but ordinary. Day and night, the fun never stops for families, singles, and couples. Sunscape's world of Unlimited-Fun® gives you one of nature's most pristine beaches, 24-hour room service, top-shelf spirits, daily refreshed mini-bar, and spectacular ocean views, all while experiencing the special feeling of being welcomed as a most honored guest. Fun in the sun awaits at the beach and pools. Fabulous a la carte restaurants and tropical drinks are all part of your escape. 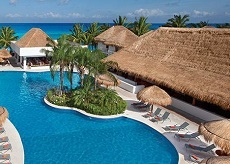 The resort features a luxurious tropical atrium, outdoor theater, pool with two waterslides, spa with world-class amenities, Explorer's Club for kids, and Core Zone for teenagers. Fantastic golfing, shopping and nightlife are all nearby. Enjoy six amazing first-class restaurants including a buffet, three a la carte options, a grill and a cafe, each offering a unique experience and flare. Be tempted by tasty international and island specialties and four bars serving unlimited premium beverages. The first-class spa features a massage and facial center with hydrotherapy rooms, soothing signature treatments, couples treatment rooms, oceanfront massage options, and brand name products, all built specifically for your relaxation and comfort. The state-of-the-art fitness center provides a full range of cardio-conditioning activity and exercise equipment including weights, treadmills, life-cycles, and step machines. 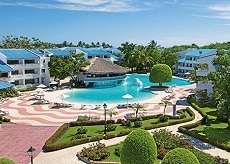 Located in the Dominican Republic is Sunscape Puerto Plata, a tropical haven that sits on beautiful Playa Dorada beach. Perfect for families, this resort features 585 spectacular guestrooms with luxurious amenities, including in-room minibars, complimentary toiletries, private balconies or terraces, and more. Upgrade to the Sun Club and take advantage of personalized check-in and check-out, a private snack bar and lounge, and other fantastic extras. Enjoy Unlimited-Fun® inclusions without ever having to put on a wristband! Head to dinner without worrying about whether or not you made a reservation! Enjoy live music and entertainment throughout the evening! With perks like this, it's easy to see why Sunscape Puerto Plata is a fantastic choice for your next getaway. Want to spend your day playing sports or enjoying the ocean? A variety of indoor/outdoor and water activities like beach volleyball, tennis, wind surfing, and snorkeling will keep you fully entertained for hours. Looking to keep your children entertained while you try something new? The Explorer's Club for Kids (ages 3-12) and the Core Zone Teens Club (ages 13-17) offer a wide range of entertainment from morning until night. Babysitting services are even available (concierge must be contacted for details). If youre looking to improve your golf swing, or you're simply a beginner who has always had an interest in the game, the Playa Dorada Golf Course ($) offers 18 holes that are as challenging as they are entertaining. Designed by Robert Trent, this 72-par course features a gorgeous Caribbean landscape. Take your best swing while savoring the unparalleled beauty that surrounds you. A full day of activities can really work up an appetite. Dine at nine delicious restaurants and savor buffet, a la carte, and snack options - without ever having to make a reservation! Whether you choose to indulge in Asian, Italian, Argentinian, or Caribbean cuisine, there is something to satisfy every palate. Each restaurant also offers a gluten-free menu and vegetarian options (please notify the resort in advance if you are gluten intolerant). Finish your meal off with a drink at one of the eight bars available throughout the property! Sunscape Sabor Cozumel is the perfect getaway for endless fun in a beautiful destination. Located on the small island of Cozumel, just 12 miles off the coast of the Yucatan Peninsula, this is the largest and most complete beachfront resort in Cozumel. Guests will enjoy a getaway complete with all of the privileges of an Unlimited-Fun vacation. With 2000 feet of white sand beach, this is an excellent choice for families, couples, and singles to enjoy countless daytime land and water activities, limitless food and beverages from four reservation-free restaurants (most with oceanfront views! ), unlimited top-shelf spirits from three bars & lounges, and so much more! The 218 guest rooms and suites at Sunscape Sabor Cozumel offer spacious and finely appointed accommodations, most with oceanfront views. Relax, refresh, and rejuvenate your mind and body at the Sunscape Spa by Pevonia. Offering a wide variety of treatments, the Sunscape Spa by Pevonia will be the ultimate place to indulge, pamper, and take care of all your beauty needs. Stay in shape at the fitness center with state-of-the- art cardiovascular equipment, weights, life cycles, and more. Located near the second largest barrier reef in the world, take the opportunity to explore the tropical underwater world of the Great Mesoamerican Reef through scuba diving and snorkeling! Convenient to championship golf, exciting shopping, and so much more, guests can enjoy everything that the island of Cozumel has to offer. Sunscape Sabor Cozumel offers the ultimate fun in the sun getaway with many different daily activities and night time entertainment. Kids will have a blast with all the fun-filled activities at the Explorer's Club, a fully supervised program with extended hours for children ages 3-12. Experience Unlimited-Fun® with a Jamaican twist at the exceptional Sunscape Splash Montego Bay. Nestled away on a secluded peninsula overlooking the Caribbean Sea, this all-inclusive resort offers guests of all ages an unforgettable getaway. Only minutes away from the Sangster International Airport, this property is ideal for guests desiring a stress-free, fun-filled vacation. Unwind on over 1,800 feet of pristine beach with sugar white sands and stunningly turquoise Caribbean waters, or take a dip in one of the resort's four pools. 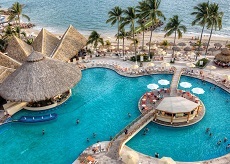 Guests enjoy a wide variety of daily activities such as snorkeling, beach volleyball, kayaks, and more. For additional fun, Montego Bay's "Hip Strip" is only minutes away and features daytime shopping, local handcrafts, and an exciting nightlife. Explorer's Club for kids and Core Zone Teens Club offer supervised activities, such as access to Pirates Paradise Waterpark featuring a Pirate Ship and a lazy river. For tweens and teens, the resort offers social media events, photography and DJ lessons, and weekly meet-up mixers. With six exquisite restaurants on-site, there is surely something for everyone. Four a la carte restaurants include authentic Italian, Pan-Asian fusion, a Seaside grill, and traditional Montego Bay cuisine. Enjoy delectable cocktails at any of the six bars and lounges throughout the resort. Each of the 430 guest rooms and suites include a private and furnished balcony, a fully stocked minibar, and 24-hour front desk services. For guests seeking the most elegant experience, the Sun Club offers upgraded amenities, personalized check-in, special treats for children, access to two exclusive restaurants and a private Sun Club lounge, and more. Call your Vacation Specialist at 800-278-4736 TODAY!